Greg Verdino will draw upon the key themes presented in his book microMARKETING: Get Big Results by Thinking and Acting Small, to help you understand why the Web is getting “smaller” every day; what this means for your business; and how to create a social marketing strategy that emphasizes relationships over reach, interaction over interruption, social networking over broadcast networks and the right small things over big-budget media buys. His thoroughly modern take on micro-marketing will empower you to rethink, retool and revitalize your marketing strategies to take full advantage of the opportunities created by the micro-content explosion. 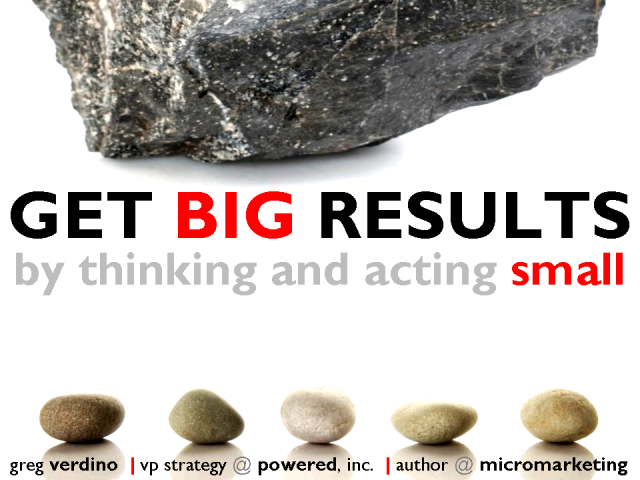 But you’ll need to start thinking and acting small if you want to succeed.